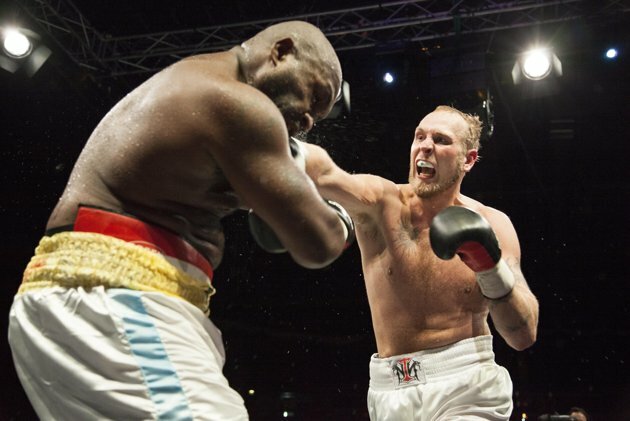 The Nordic Nightmare is back: Robert Helenius, now 18-0, returned after almost a year out due to injury and outscored dangerman Sherman "the Tank" Williams over ten. It was scored 99-91, 99-93 and 98-93. However, Williams had a big moment in the sixth when he hurt Helenius with a big overhand right. Robert staggered and was in big problems as Williams followed up but recovered quickly and was allright by the end of the round. After this Helenius was a lot more careful in order not to fall into the traps laid out by Williams, short, skillful fighter, a lot like Garing Lane, if anyone remembers him. Helenius looked a bit stiff in the first. -I was a little nervous, said Helenius afterwards in his first fight after eleven months out. Williams acknowledged defeat and wanted to come back to Finland - but in the summer when it is not so cold and one can only agree. Danish middle Patrick Nielsen won a close, unanimous decision over Belgian Jamel Bahki over ten rounds to retain the WBA I/C title. It was scored 96-94, 97-95 and 99-91. Bahki took four rounds before getting started but once he went to work he showed good skills and outhustled the Dane, who picked up a nasty cut in round seven after a clash of heads. Nielsen also bled from the nose and appeared to be confused by his tricky opponent. Bahki could have won had he only gone to work earlier. Swedish lightheavy Erik Skoglund floored Hungarian Gyorgy Marosi twice in the first with bodyshots and it was stopped at 2.59. It was scheduled for eight. Skoglund is now 13-0 and is almost certain to have his next fight on the Kessler vs Magee undercard December 8 in Herning, Denmark. The Finnish Butterbean, Janne Katajisto won a unanimous decison over six against big Croatian spoiler Ivica Perkovic. It was scored 59-56 twice and 58-57. French middle Ahmed Rifaie stopped Timo Laine, a part time model, in the eighth and final round in what was the fight of the night, mainly due Laine´s brave showing. Rifaie scored at times almost at will and while Timo never was hurt he took a bad beating and this one could well have been stopped earlier. Norwegian feather Andreas Evensen outscored slick French journeyman Philippe Frenois over ten. It was scored 100-90 twice and 99-91. Frenois protected himself and while outworked he was never in any problems. Evensen will next challenge EBU champ Alex Miskirtchian and there is an agreement in place with date and site open. Finnish middle Fitim Latifi outscored Norwegian Alexander Jacobsen over six in a fight between to fighters at 2-0. Latifi was the much quicker though and floored Jacobsen in the fourth for a win on scores of 59-55 twice and 59-55. Danish feather Dennis Ceylan made hard work of small Belorus Anton Bekish but won clearly on points after four. Patrick Nielsen´s younger brother Micki swept aside inept Belorus Dzianis Vardomski for a tko win in the first.